What do you guys think of having a RP guirld raid progression? With our busy calendars with RP events and such we cannot always "compete with the big boys", but I'm sure we're all proud at our own progression as well! So! 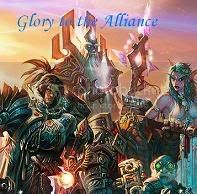 If you are in a RP guild, an alliance between RP guilds, a RP pugger, ... feel free to post your progression here! We've downed lower, plague, Blood and we're up to Sindy, on ICC10 man. I can only speak about ICC for the Vanguard of Valor, but we've cleared everything up to and downed the Lich King on normal 10. No Ruby Sanctum too. ICC - The first four plus Rotface and Festergut in ICC. So 10/12 in ICC. Sindy will fall soon, and we're also working on Ruby Sanctum. And also all of Ulduar is cleared. I added the raids I forgot, and I updated the list. Please check if I have forgotten anything!